Although we have only been in school for 4 days this week, we have squeezed in plenty of exciting learning! We were really delighted to share all aspects of the children’s learning with you at the two Parents’ Evenings too; if you were not able to make it, please speak to your class teacher to arrange another suitable time. 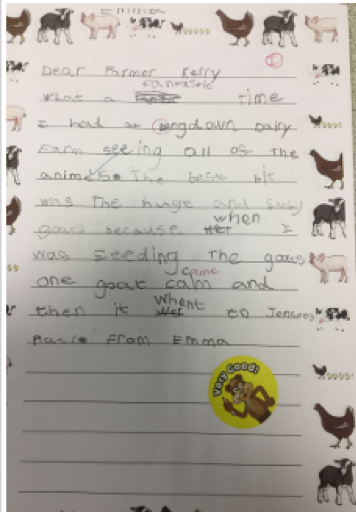 In English this week, we planned and wrote our farm stories, based on ‘Farmer Duck’ by Martin Waddell. 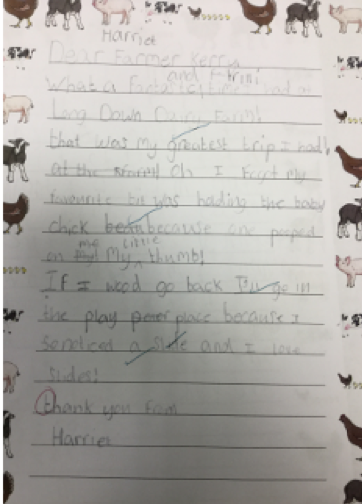 We were so impressed to see how the children structured their stories and included many of the grammatical features that they have learned during this unit of work. We have compiled a class book of the stories which we are looking forward to sharing with other children at Stanmore Primary School. We have also sent off our ‘thank you’ letters to Longdown Dairy Farm. Here are some examples of the children’s independent writing. Multiplication and division has been our maths focus this week, particularly multiplying by 5 and 10, and seeing how we can use multiples of 10 to derive multiples of 5. The children have explained their understanding throughout the activities. Next week, we will be revisiting fractions (halves and quarters) and applying our knowledge to a range of problems. In science, we have started to look at animals and their young, identifying their similarities and differences and why this might be. We have also spent time outside in the Quad to explore the seasonal changes and hunt for signs of spring. We compared our observations with those that we made in winter, noting the changes to flowers, trees, the weather and our clothing. We continue with our guided reading and phonics daily. We hope you had a wonderful 3 day weekend!